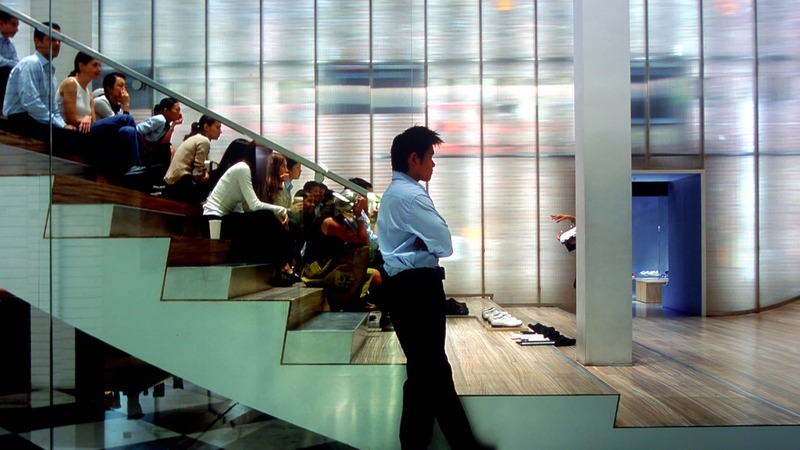 Fashion and culture; high and low; cross currents in a space for retail experimentation and cultural activities. 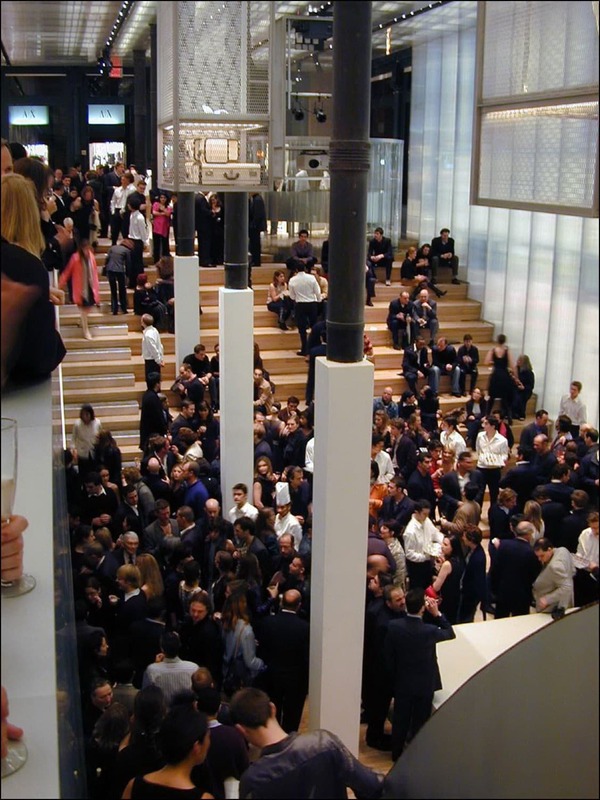 The New York Prada Epicenter is a conversion of a 2,200 square meter space in SoHo, formerly belonging to the Guggenheim Museum, into a flagship fashion boutique; public space; exhibition space; and experimental laboratory for shopping. 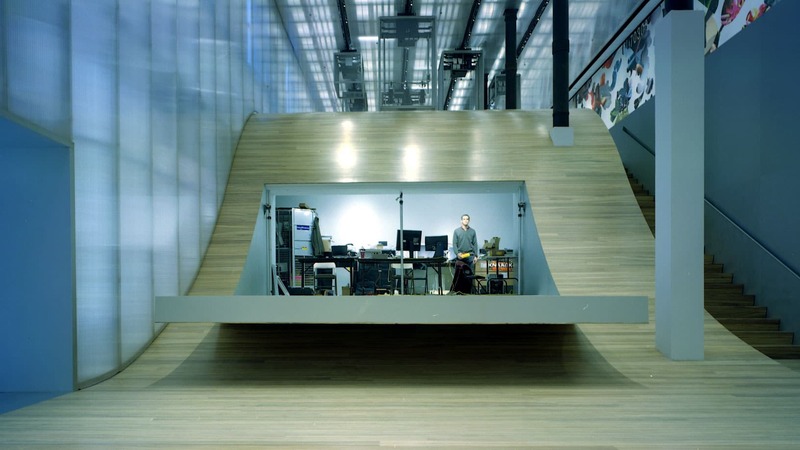 The “Wave” – a curving space that slopes down from the ground floor and opens up to the basement – is the main gesture that enables experimentation and transforms the retail space into other functions. 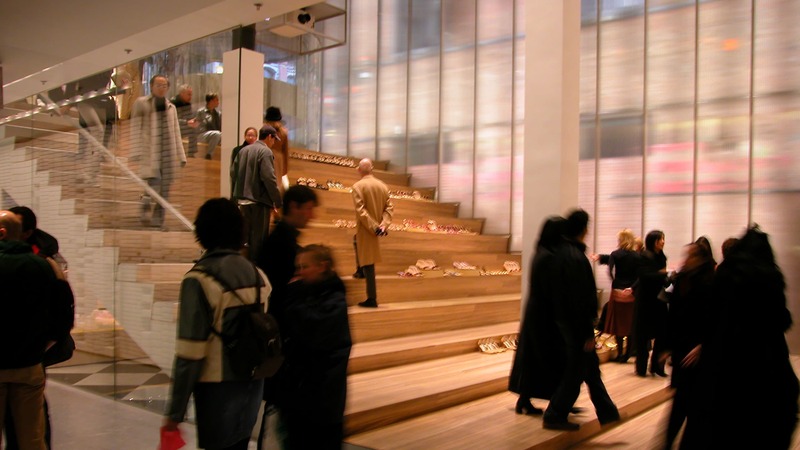 One side of the Wave steps downwards for fashion and exhibition displays, but also forms a seating area facing the other rising side of the Wave, from which an event platform/stage unfolds. The store is transformed into a venue for lectures, performances, and film screenings. 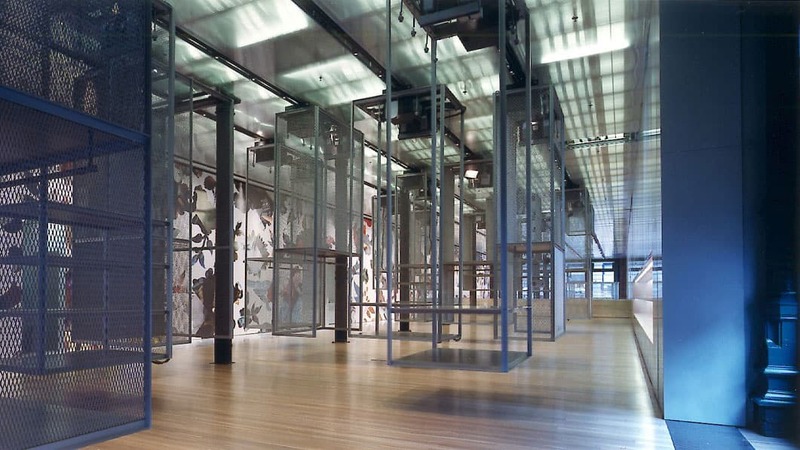 The northern wall of the store runs uninterrupted between the entrances on Broadway and Mercer Street and provides a surface for a giant street-length mural – the Prada wallpaper – that changes on a regular basis and defines the theme for the exhibition of artifacts that infiltrate spaces throughout the store: videos on hanging flat screens and interactive monitors are interspersed with merchandise, delivering both “aura content” and detailed design information of the merchandise. A “hanging city” of movable metal cages is suspended from the ceiling for the flexible display of clothes, mannequins, and accessories. Several of the cages are equipped with audio/visual equipment and the entire arrangement can be reconfigured to provide technical support for events. 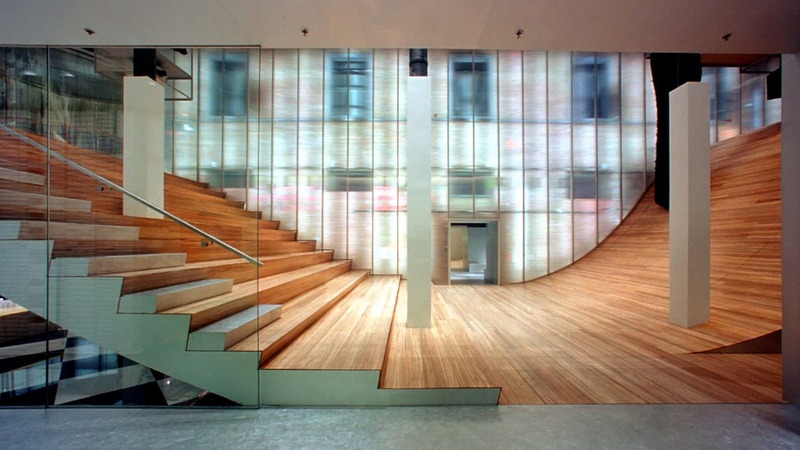 A circular glass elevator doubles as a handbag and accessories display, while bringing visitors to and from the basement. 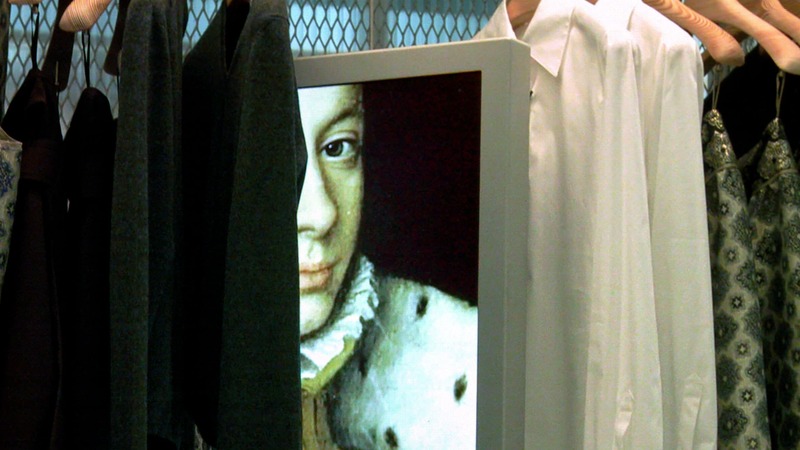 Dressing rooms are equipped with liquid crystal glass doors that change from clear to opaque at the touch of a button, and plasma screens embedded in the mirrors reflect live views of the customer from different angles. Experimental technology, unorthodox materials, and innovative display methods are utilized to both enrich and transcend the traditional shopping experience. 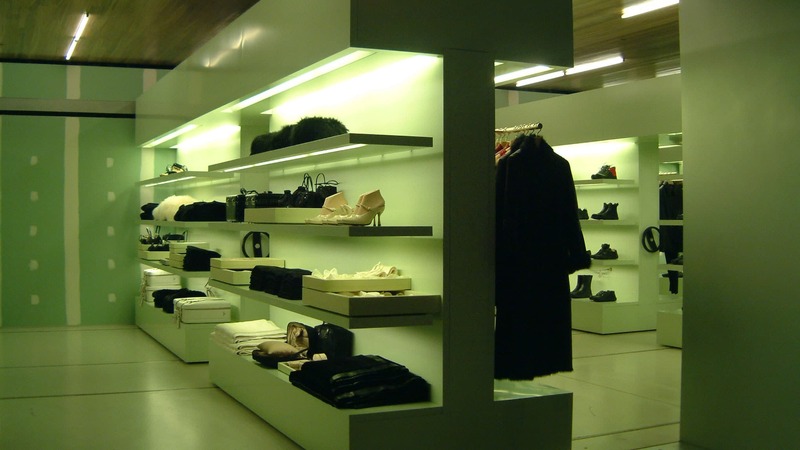 Unfinished gypsum board walls, compact library storage systems repurposed as display shelving, plywood furniture, and translucent polycarbonate walls covering the original exposed brick structure create an environment that is raw and refined, luxurious and un-precious, exclusive and intriguing.